Is your kitchen missing something? Maybe it’s style, maybe it’s shelving, maybe it’s better use of the space you have. Whatever your kitchen or pantry dilemma may be, wire shelving is going to be the solution. Fix your pantry with sleek chrome wire shelves for maximum space and efficiency. Expand upward instead our outward with high stacking wire shelving. 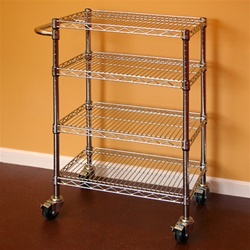 You won’t just find standard wire shelves here at Shelving Inc., here you’ll also find stylish chrome wire wine racks and sturdy wire utility carts that allow for mobile storage. Wire shelving is also extremely low maintenance chrome wire shelving for less dust, and easy retrieval of goods and food. When you choose chrome wire shelving for your kitchen, you can create a completely custom look and organizational system. We offer various shelf sizes, depths, kits and accessories to make your space work for you! Order up handy accessories for your wire shelving to make your pantry and kitchen even more efficient. Among the wire shelving accessories, you will find wheels, bins, hooks, cup holders and rails. One of the perks to using chrome wire shelving is the open design which minimizes dust accumulation. Cutting back on dust and dirt is a must, especially in the kitchen when dealing with food storage and cooking. Make sure you browse through out hardwood shelf inserts for an immediate word area and stylish stability. Make over your kitchen or pantry today, with wire shelving from Shelving Inc.